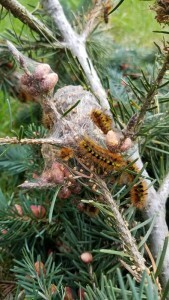 In early May I noticed some caterpillars in a Douglas Fir I was pruning away from a roof in Seattle. A little investigating online and in a few of my resource books confirmed that they were silver spotted tiger moth caterpillars. Douglas fir (Pseudotsuga menziesii) is the principal host, but they also feed on a few other conifer species. 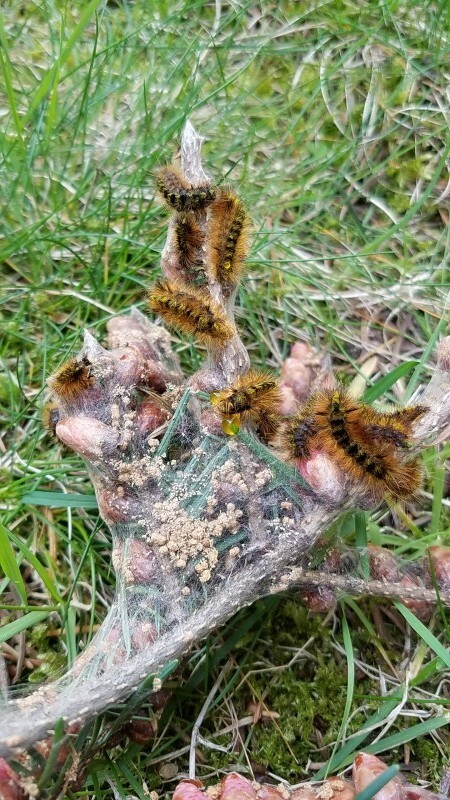 One of the keys in identification of this species is the large size of the caterpillars at this time of the year (mid April to early May). Nearly all other species don’t reach this size until later in the summer, so seeing a caterpillar of this size narrows down the options tremendously. Their eggs hatch in the late summer or fall, and they will feed on needles during warmer winter days. By June, Lophocampa argentata start spinning cocoons near their host tree. Adults start flying in July and August, laying eggs to start the life-cycle again. Thankfully natural predators such as parasitoid wasps and songbirds nearly always keep this defoliator in check and don’t allow it to cause long-term damage. If their presence becomes intolerable, the individual branches with the webbing can be pruned out and destroyed. This entry was posted in Pests and Diseases. Bookmark the permalink.